The Death of Lord Robert Manners, T. Macklin, 1786, Michael Finney Antique Prints. This print is currently for sale through Michael Finney Antique Books and Prints. 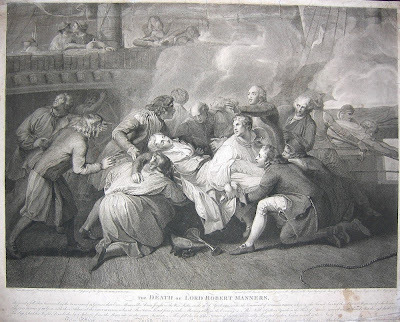 It depicts the death of Captain Lord Robert Manners, HMS Resolution at the 1782 Battle of the Saintes. Like many "Death of" paintings and prints of the period, this is an overly sanitized version. In truth, Manners broke an arm and took severe wounds to both legs, requiring the amputation of one of them. At that, he did not die in battle, but from the subsequent lockjaw that followed his wounds. I don't usually address officers on this blog, as our focus is the common sailor, but this print features a good number of sailors, and gives us an idealized yet helpful picture of their dress. Oh, and it might be worth noting that there is a nearly identical print in the collection of the National Maritime Museum. 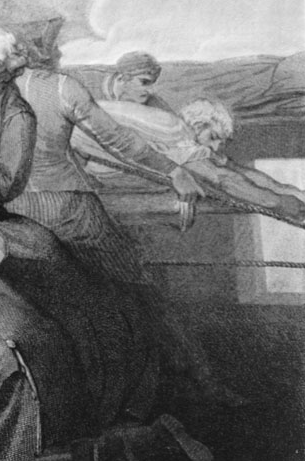 In the background on the upper left, up on the quarterdeck behind a railing and a line of buckets, are a pair of sailors looking on as Captain Manners is carried away. The sailor on the right holds what might be a fid, though it is difficult to tell. His hat is a round hat with a short crown and a floppy, short brim. He wears a single breasted jacket without collar, and a plain neckcloth tucked into the jacket. To the left is another tar in a very similar round hat and a shirt with neither waistcoat nor jacket. Directly beneath them and almost hidden in the dark background is the helmsman, whose sleeves are rolled up almost to the shoulder, and wearing a pair of trousers. More immediately to the foreground is one of the few depictions of a black sailor that I've come across. He wears a pair of trousers, an untucked shirt without waistcoat, and a black neckcloth. Another tar with long locks of loose curly hair wears a jacket with a single vent at the back, a pair of slops, and plain stockings. At first I thought that Manners' head and shoulders were being supported by some unspecified wreckage and sailcloth, but it turned out to be a sailor! The jack wears a plain white shirt with no waistcoat, slops, and plain stockings. Behind Manners is a mariner with a bald head, who wears a black neckcloth and a waistcoat with narrow horizontal stripes. Two more sailors clutch Manners' legs: one without a waistcoat and wearing a striped neckcloth, the other with a dark waistcoat and a round hat to match his mates on the quarterdeck. Three sailors run out a gun as Manners is led away. The sailors reaching furthest forward is fairly unremarkable, as we can't see any details beyond his shirt. Yet, the other two sailors wear jackets with tape! Much more common during the French Revolutionary and Napoleonic Wars, British sailors of the late eighteenth century do not appear to have worn these very often. This is the first appearance of such decoration in any of the images we've examined. The white tape lines the seams of the jacket. The tar further aft wears a cap of some sort, while the jack in the foreground wears a cocked hat with a flat topped crown and a pair of striped trousers.